What Foods You Should Eat to Prevent Osteoporosis? Osteoporosis is explained as a systemic skeletal disease specified by low bone mass and microarchitectural decline of bone tissue, with a consequent increase in bone fragility and susceptibility to fracture. The loss of osseous tissue and bone lamellae in spongy bone proceeds faster than bone formation, leading to the loss of bone flexibility and stability (Kostecka, M. (2014). The role of healthy diet in the prevention of osteoporosis in perimenopausal period. Pakistan Journal of Medical Sciences, 30(4), 763–768). The loss of bone mass often proceeds unnoticed and it is a continuous process which may not produce any symptoms. Bone mineralization is significantly affected by calcium and phosphorus metabolism which is controlled by vitamin D, parathormone and calcitonin. Osteoblast and osteoclast activity is regulated by cytokinins, estrogen, and testosterone (Kostecka, M. (2014). The role of healthy diet in the prevention of osteoporosis in perimenopausal period. Pakistan Journal of Medical Sciences, 30(4), 763–768). Physiological loss of bone mass is observed, and the relationship between organic collagenous fibers and inorganic salts is changed after the age of 40. Osteoporosis is more likely to affect women than men, and it is more prevalent in Caucasian and Asian females. The other cause of osteoporosis includes low estrogen levels, genetic predispositions, low body weight, smoking, excessive consumption of coffee, long periods of immobilization, deficiency of calcium, 1,25-dihydroxyvitamin D and protein. Calcium is essential for healthy bones. The body uses and loses calcium every day. Because the body does not make calcium, you must get calcium from the foods you eat. The amount of calcium needed in your diet every day is 600 milligrams for adults over 50 years old and 500 mg for children ages 9 to 18. Dairy foods are rich sources of calcium such as Milk, yogurt, cheese, and frozen desserts are popular sources of calcium. Dairy foods with lower fat and water content are more concentrated sources of calcium. Leafy green vegetables contain 150 to 270 mg of calcium a serving. Other calcium-rich foods include Sardines and salmon with bones, Tofu Almonds, Calcium-fortified foods such as orange juice and cereals. Good sources of protein include meats, poultry, and fish, nuts and seeds, dairy products, dry beans, and peas and eggs. The protein requirement for women is 55 grams per day and it is 60 grams per day for men of the same age. Vitamin D is necessary for calcium absorption and consequently to prevent bone loss. People may be able to meet their vitamin D needs by getting at least 15 minutes a day of sun exposure. 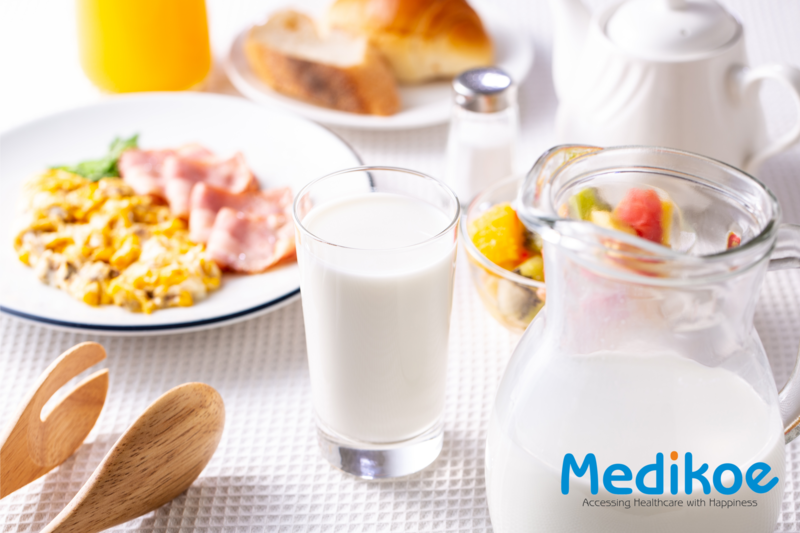 Milk, egg yolks, saltwater fish and liver are rich sources of Vitamin D.
whole grains, meats, beans, nuts, and seeds help ensure that you’re getting what you need. Try to get your nutrients from food rather than relying on multi-vitamins.